I have a 1969 Fisher Holivan that has the beige quilted sides. It is a 2 berth with rear, near side stable door, kitchen across the back wall with a large wardrobe/toilet compartment in the rear off side corner. The 2 6' long parallel seats are at the front and that's it!! Can anyone please tell me what the unladen and maximum laden weights are for this van as there seems to be very little info on the Net and she isn't plated. What a great classic caravan. Does anyone out there have the information that Helen needs? if so just contact us and we will pass it on. I believe this van was designed to be towed by the old style Mini and would be grateful for any information you can give me!! Comments for 1969 Fisher Holivan Weights?? Is anyone selling 4 berth fisher holivan? wanted spare seats for a Holivan. Has anyone got one for sale that needs work? My wife and I owned a petite 29years ago I know this as she discovered she was expecting our daughter just after we bought it. Sadly we had to sell it not many months later. I very much enjoyed the rear entry door and rear awning facility as well as the light weight. I would love to find and buy another one. Are there any still around ? To anonymous or anyone else out there, I would really love to see a copy of a holivan brochure. I have one that i believe is the smallest size they did and around 1960. Id like to see a picture of an original interior so i can restore mine accurately. We brought a Fisher Holivan 2 years ago, from a scrap yard. She was in very good condition, just gave her a good clean. now we take her to all the vintage shows , we think she is 1960s, been looking for more information but can't seem to find anything, can anyone help. Had one of these for several years and towed it successfully with a 600cc Citroen 2CV. Caused quite a stir particularly on Caravan Club sites! I have the same van that came with the original documentation, servicing guides etc. 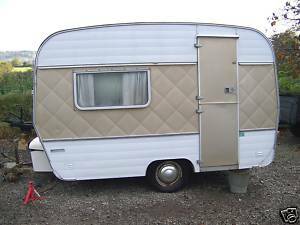 So hard to find now, we saved one last year from being scarped, its 1970s 9 ft long, was in great condition.Gold and white,light weight caravan. It's so cute. sanda.11@hotmail.com. Any make, any condition!! We have an oldish caravan, and a similar problem. I found the un-laden weights by using our local council weighbridge, for a charge of just £2. (Ashfield district council), not sure what others charge. Can't help with the MTPLM though, sorry.